Innovation and most out-of-the-box thinking will fail if the fundamentals are ignored. 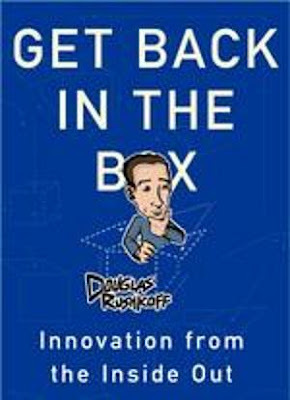 Get Back in the Box: Innovation from the Inside Out. Douglas Rushkoff. Collins. 336 pages. In this book, Rushkoff joins people like Seth Godin, Guy Kawasaki, Daniel Pink and the ''Cluetrain Manifesto'' guys who understand that business has changed dramatically, mainly due to increased choice, media fragmentation and the Internet. But, like dinosaurs with a huge bodies and tiny brains, many firms just can't seem to move fast enough, or break their old, bad habits. Worse, they seek quick fixes, fast turnarounds and overnight transformations without making the fundamental changes or commitments required to really improve the ways they interact with their customers and employees. And when the needle fails to move after their half-hearted atmospherics fall flat, they're baffled. Rushkoff's mission here seems to be to bring companies back down to earth. They should rely on their core competencies, and anticipate and fulfill their customers' needs based on their own knowledge, experience and insights. Innovation is worthless unless it's backed up with what made the business successful in the first place. Rushkoff provides a pleasant narrative, contrasting companies that get it with those that don't, adding asides and insights on what they're doing right or wrong. He's witty and a bit silly (but with a purpose), as when he asks, ''Who would you rather be? Steve Jobs or Bill Gates?'' to illustrate the differences between Apple and Microsoft, and how it's important and powerful for employees and customers to be engaged and have fun. And that leads to another point; Rushkoff makes a strong case for employee involvement and empowerment, correctly pointing out that customers, employees and vendors all hold important stakes in the success of a business. This may be painfully obvious to all but the most oblivious, but anyone working in an environment where morale is low knows the effect it has on every interaction. He is also quite wary of consultants, particularly those who seem to ''understand our business better than we do.'' Executives who feel that way, he says, are in big trouble. If an outsider knows your business better than you do, it may be time to look for another gig. Rushkoff is a good writer, but there is very little herein that I hadn't read elsewhere. Getting back in the box isn't a bad idea at all, but he clearly values the out-of-the-box stuff as much as the next guru, so the title is a bit of a misnomer. Perhaps a better one would have been "Before You Get Out of the Box," but maybe I ought to stick to my fundamentals, too. Published 1/9/06 in The Miami Herald.